The Thomas Jefferson Planning District Commission (TJPDC) coordinates planning across a wide variety of jurisdictions and regulatory agencies. The TJPDC provides resources to the City of Charlottesville and surrounding counties. Services rendered include grant applications and management, assistance with strategic and comprehensive plans, and technical assistance with transportation, land use and economic development plans. The TJPDC totals 2,169 square miles and includes 227,107 people in five counties and one city. 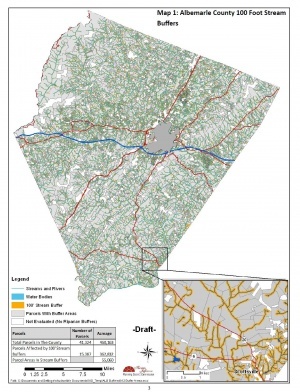 In July 2012, the TJPDC unveiled a searchable database that allows the public to view and compare documents from the Charlottesville and Albemarle County Comprehensive Plans. The database was developed through a $1 million grant from the U.S. Department of Housing and Urban Development and contains over 12,000 documents. In 2012, Albemarle County staff asked the TJPDC to evaluate whether a program to waive property taxes on stream buffers would encourage conservation and increase water quality in the Chesapeake Bay. In 1998, the General Assembly passed enabling legislation allowing localities to do so. The study concluded that a program would benefit landowners with high-value and smaller properties. Large parcels would likely not see a benefit because of the high costs with planting vegetation as well as the fact that many of the parcels are already in land use taxation. The TJPDC was created in 1972 in order to "promote the orderly and efficient development of the physical, social, and economic elements of the Thomas Jefferson Planning District by planning and encouraging and assisting governmental subdivisions to plan for the future. In October 2010, TJPDC received a three-year $999,000 grant to develop a regional sustainability implementation plan. The Sustainable Communities Regional Planning Grant is sponsored by the U.S. Department of Housing and Urban Development. Billie Campbell, TJPDC's Chief Operating Officer, said it was a highly competitive grant application process with 225 submissions, 45 awards, and only 3 in Virginia (Roanoke, Radford, and Charlottesville). "The existing Regional Plan for Sustainable Development in the Charlottesville/Albemarle metro area is the Sustainability Accords. These policies were adopted in 1998 as a result of a four-year process with broad regional support and wide participation by members of the public..."
Problem: Lack of available metrics to identify the region's status in pursuing sustainability..."
The Jefferson Area Tea Party is skeptical of the Livable Communities Planning Project grant, and is concerned it is a sign that international organizations have usurped power that they say belongs to local officials. At the September 2012 meeting of the TJPDC, Williams told his board that two planners hired as part of the initiative would be let go several months earlier than expected. City and county staff have disputed his interpretation of why the grant money was running out. Harrison Rue served as executive director from 2002-2008. Harrison Rue stepped down June 30, 2008 to take a position with ICF International. Stephen W. Williams served as executive director from 2009-2013. The TJPDC Board of Directors voted unanimously not to renew Williams' contract. His contract expired August 1, 2013. ↑ Thomas Jefferson Planning District Commission. February 2010 Long-Range Transportation Demand Management (TDM) Plan (Working Draft). Rep. Web. 23 July 2010. <http://tjpdc.org/pdf/transportation/TDMLRP_100713.pdf>. ↑ Web. [Print The Seventies: Central Virginia Ends Decade of Joy and Tragedy], Doug Kamholz, Daily Progress, Worrell Newspaper group, January 1, 1980, retrieved May 11, 2015. ↑ Web. Many plans, one database, Sean Tubbs, Charlottesville Tomorrow, July 30, 2012, retrieved July 31, 2012. ↑ Web. Fiscal Analysis of Tax Exemptions for Stream Buffers: Albemarle County, TJPDC Staff, Thomas Jefferson Planning District Commission, October 4, 2012, retrieved October 17, 2012. ↑ Web. , Daily Progress, retrieved 21 Oct. 2010. ↑ Planning and Coordination Council Meeting. City Space, Charlottesville. 21 Oct. 2010. Public Meeting. ↑ Thomas Jefferson Planning District Commission. Applicant Abstract: Charlottesville Region Sustainability Implementation Plan. Charlottesville, Oct. 2010. Print. ↑ Web. Tea Party hosting forum to review local sustainability initiatives, Brian Wheeler, Charlottesville Tomorrow, March 17, 2011, retrieved March 17, 2011. ↑ Web. TJPDC livability planners to be let go early, Sean Tubbs, Charlottesville Tomorrow, September 8, 2012, retrieved September 10, 2012. ↑ "Thomas Jefferson Planning District Commission." Thomas Jefferson Planning District Commission Redirect. Web. 10 September 2010. <http://www.tjpdc.org/home/commissioners.asp>. ↑ E-mail. Ryan Pace at RPace@tjpdc.org, TJPDC. "Press Release: TJPDC Announces New Executive Director." Message to news@cvilletomorrow.org. 24 March 2014. ↑ Web. Williams out as regional planning director, Sean Tubbs, Charlottesville Tomorrow, 13 June 2013, retrieved 23 July 2013. ↑ E-mail. TJPDC. "TJPDC News Brief." Message to Brian Wheeler, Charlottesville Tomorrow. 24 July 2013. This page was last edited on 9 September 2018, at 23:41.